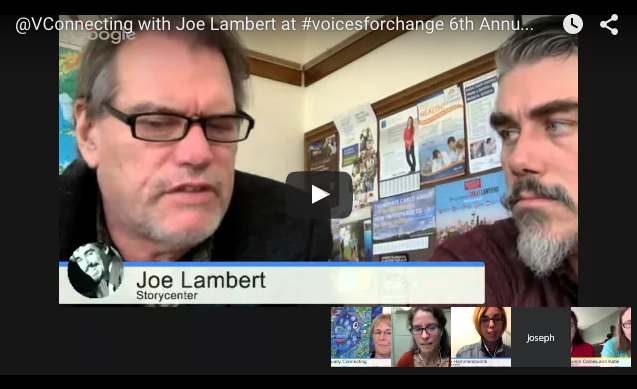 We are virtually connecting with Joe Lambert at the Voice for Change – Digital Storytelling 2015 Conference in Massachusetts. HJ DeWaard will be the virtual buddy while onsite buddy, Joe Murphy, will be present at the conference and hold the informal conversation with Joe Lambert – Story Centre founder and executive director. His Digital Storytelling Cookbook and Digital Storytelling: Capturing Lives, Creating Community are valuable resources for those interesting in learning about digital storytelling in the classroom and community. To join virtually, please tweet to @vconnecting or to one of our buddies, or leave a comment below. Sometimes it’s tough to travel. You just can’t get to meet people, have conversations, join together to play with new tools or even just hangout to talk. Teachers need this time more than anyone. 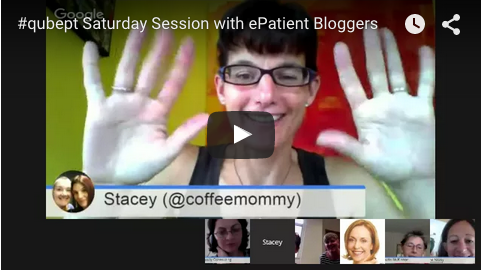 Sharing ideas, tips, tricks, resources, and tools takes time. Having a chance to reflect, by talking through ideas is a great way to get better together. The metaphor for this blog reflects how important it is for educators to sit down around the fire (or any other gathering space) to talk through things with willing listeners. Two upcoming events for me will allow conversations from far and near; the far is through virtually connecting. One such conversation will be with Joe Lambert, someone who’s work and writing has guided my teaching about digital storytelling. I will be hosting my first Virtually Connecting hangout with participants and speakers at the Voice for Change – Digital Storytelling 2015 Conference in Massachusetts. I will be the virtual buddy while onsite host, Joe Murphy, will be present at the conference and hold the informal conversation with Joe Lambert – Story Centre founder and executive director. His Digital Storytelling Cookbook and Digital Storytelling: Capturing Lives, Creating Community are valuable resources for those interesting in learning about digital storytelling in the classroom and community. Joe Lambert’s sessions at the conference focus on digital storytelling through the public health lens and stories to validate experiences of youth in current social, economic and labour markets. As part of my preparation for this event I’m in my own digital sandbox, exploring the affordances, issues, challenges and success with Google Hangouts (GHO) On Air. I had an informal, impromptu personal coaching session – my coach was in Cairo Egypt (thanks Maha!). We communicated using Slack and Twitter, while using a GHO in a non-recording session. For a brief time I turned on the recording function with a resulting feeling of success after working through several technical glitches and issues. The technical can interfere or interrupt the physical conversations, but virtual conversations extend the range and enhance the possibilities. Then I set up the hangout space and invited Joe Murphy to practice in the space and get to know him. We had an informal conversation about our similarities, perspectives and backgrounds – from Ontario to Ohio. 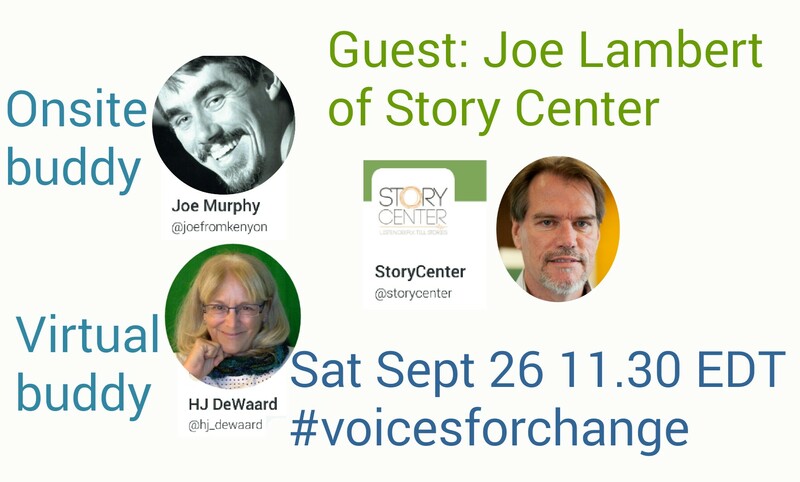 The link to Saturday’s session is all ready to go @VConnecting with Joe Lambert at #voicesforchange 6th Annual Digital Stortelling Conf. I’ll continue to explore this format for conversations throughout this week and reflect on the experience in a followup post. I’m also preparing for conversations that will be ‘near’ only because I will travel a significant distance to be present. I’ll be with educators who want to learn together about tools and technologies to infuse into their teaching. This week I’m making time to prepare resources, review practices, make adjustments to materials, play again with some of the tools and plan the journey. I’ll be the lead learner with teachers at IGNITEd on Manitoulin Island. It’s a trip I’m looking forward to making – it’s a wonderful time to travel in Ontario with leaves just starting to change colours. I’ll learn so much from them as they explore green screen, screen cast and stop motion animation. The conversations will build connections. The learning will continue beyond the fireside time. Where do you find conversations happening? Are they F2F or through digital fireside chats? Maybe the water cooler is a preferred spot to gather. Coffee conversations are the ‘go-to’ choice for many.